In Egypt Roman coinage was based until AD 296 on the Ptolemaic system. The first issues are some copper based coins. Regular production started in AD 20 with a tetradrachma. Most of the coins in Egypt were struck at the main mint in Alexandria. As with many Roman provincial coins, the obverse usually depicts the portrait of the emperor or members of his family. The legends are in Greek. The reverses are varied and offer many types only known from Egypt. Some depict gods such as Sarapis and Isis. Personifications of the virtues such as Nile on a crocodile or Nike ('Victory' in Greek) holding a palm branch are also common. The representations on coins seldom reflect political or other current events. Issues for the Egyptian nomes can be found honouring the administrative provinces and are typical of the second century AD in the Antonine Period (AD 138 - 180). The symbol "L" on the coins is usually used for the word "year" and is followed by the regnal year of the Emperor issuing the coin. Knowing the years of an emperor�s rule, it is possible to calculate the year the coins were minted. The tetradrachma was issued in silver but was soon debased over a steady period until it was practically pure bronze with a light silver wash. The drachma was issued in silver only under the reign of Claudius and then was exclusively a bronze issue. The system was change in AD 296 when Diocletian reformed the coinage system in the whole empire. Old coins now completely disappeared . 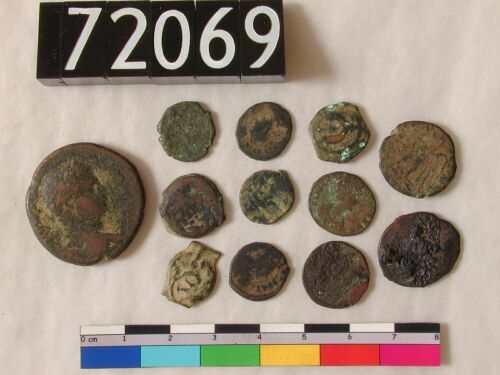 Only copper (follies) and a few gold coins were minted. The follis were used in daily life. From 491 to the time of Justin (518-527) the Alexandrian mint stopped working. Under Heraclius a new system was introduced: 12 (dodecanoummia), 6, 3 noummia. Larger 33 noummia coins were also minted. With the Arab conquest the system did not change.